When the “Neon Lights” album was announced, the most intriguing thing about it was not that the band were active after the failure of “Néapolis” three years earlier. It was that there was a mooted follow up album of original material to quickly follow it to the market. Of course, we now know that by the turn of the century, Simple Minds were effectively hung out to dry, with Chrysalis rejecting the “Our Secrets Are The Same” album as well as dropping the band from the label. What we didn’t know at the time was that for all intents and purposes, the band had nominally retired [without announcing as such]. It was only when Jim Kerr had connected with Italian DJs in his new home of Sicily, that spurred him on to reactivate the group. The covers album [“Neon Lights”] had been a varied, and potentially vexing album of highs, lows, and many new techniques given a try in the cause of seeing what had worked. The band had hooked up with Gordy Goudie who with Charlie Burchill, had become a two-man band capable of doing it all. In what would become something of a standard with the band moving forward, the cover versions were used as a laboratory to play with new techniques, inspirations, and ideas. The next album had actually begun its recording concurrently with “Neon Lights,” in January of 2001. When the cover album appeared in the Fall of that year, the album or original material was said to less than a year out from that earlier release. I had a hard time believing that at the time, since I had cut my teeth on bands issuing up to two albums a year in the late 70s and later issuing grandiose plans that never came to fruition. An album in the hand is worth a dozen in the press release! Deeds, not words, count in the end. I eventually bought these singles in a Tower Records a month after getting the “Cry” album in what was the last time I would ever see the new Simple Minds single for sale in a store at the time of release. Going forward, almost everything else that I would buy from this band would require mail order purchase. Buying physical singles from Simple Minds would require a level of Monastic Devotion that even now, I have not been able to match. The “Homosapien” single drew a line in the sand where following a single label from a single country would definitely not yield a complete Simple Minds discography on one’s racks. There were at least a dozen releases from “Cry” in CD and 12″ formats, with none of them being UK releases. Only the German CD singles of the title track reside in my Record Cell. Even now. Gulp. Fortunately, I had better luck with the US CD of “Cry” with a special order of it at the late, lamented Almost Blue Records. After some waffling on the US release date, the store called me up some time in June and I was able to give the disc a listen. This entry was posted in Core Collection, Rock GPA, Scots Rock and tagged 2002, Cry, Rock GPA, Simple Minds, The Crystal Ark. Bookmark the permalink. Right, experiments tried, lessons learned. 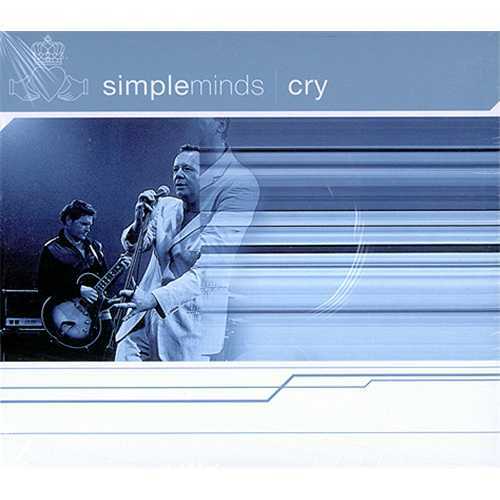 Simple Minds ready to confidently record, release and progress… Cry is full of wonderful SM touches. The circular synth/guitar opening, prominent bass and rising electronic woosh that brings on the chorus made me smile at the time. It stands the test of more than a decade now. Kerr sounds impassioned and urgent – a man on his game…once again.